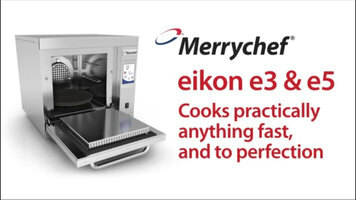 Merrychef eikon e3. Daily Cleaning. Cool down high speed oven. Place tray of ice in the high speed oven. Check the green arrow on the display and allow the oven to cool. The oven is ready when the message "display cavity" is shown. Put on protective gloves. Remove tray from high speed oven. Remove high speed oven parts. Clean high speed oven parts by hand or in a dishwasher. Put on protective glasses. Remove spillages and food particles. Spray cleaner onto sponge. Clean cavity, roof, and inside the door. Avoid putting cleaner on the door seal. Avoid scrubbing the door seal or using metallic scourers. Wash off using wet cloth. Wipe with a dry cloth. Check the green arrow under the "clean cavity" message. The display will read "apply oven protector." Apply protector by spraying onto a clean sponge. Avoid putting protector onto the door seal. Replace the clean high speed oven parts. Check the green arrow under the "apply oven protector message." Now remove, clean, and replace the filter. Replace the filter and clean high speed oven exterior. Select the green check under the "remove, clean, and replace filter" message. Preheat high speed oven and let the protector cure (30 min). Daily cleaning is now complete. To ensure longevity and optimal performance from your Merrychef eikon e3, follow these steps for daily cleaning. Is cutting your fruits and vegetables slowing you down? 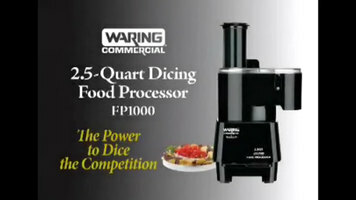 Executive Chef Fabrizio Bottero shows you how the Waring FP1000 Food Processor will chop, dice, slice, and julienne your fresh produce for you so you can focus on preparing the rest of your hand-cooked meal. 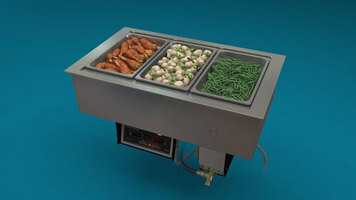 Hatco's hot and cold drop-in well allows you to hold both hot and cold food items at safe temperatures in a single unit! This video describes how to change your unit from hot to cold as well as how to clean it.